There was a moment during last weekend’s Le Mans Series epic, at just before four on Sunday afternoon, when all eyes were drawn away from the action on the track for a few minutes. It takes something pretty special to achieve that, especially when you’ve got what was probably one of the best endurance races seen in Britain for years unfolding before you. No matter how titanic the battle between Audi and Peugeot, there’s something unmissably majestic and wonderful about the sight of an Avro Vulcan trailing wisps of grey smoke across a clear blue sky. XH558 was on her way back from Leuchars in Fife, Scotland, and bound for her current (temporary) base at Brize Norton in Oxfordshire. The sole surviving airworthy Vulcan had been scheduled to display at the RAF Leuchars Air Show the previous afternoon, but bad weather had prevented her taking off. Luckily for those at Silverstone, Sunday’s skies were clear, and she was able to complete her return flight and pass over the circuit. Despite the petulant wail of forty sports and GT cars tearing around in circles, the throaty roar of her four Olympus 202 jet engines could still be heard as she swept overhead. It’s one of those wonderful sounds that needs to be felt, deep down in the pit of one’s stomach, to be truly appreciated. Well, if that sort of experience is for you, and you missed her chance flypast on Sunday, don’t despair. She is due to make a repeat appearance this weekend, not only at Silverstone to mark the start of the Britcar 24 Hours, but also above Goodwood on Sunday. 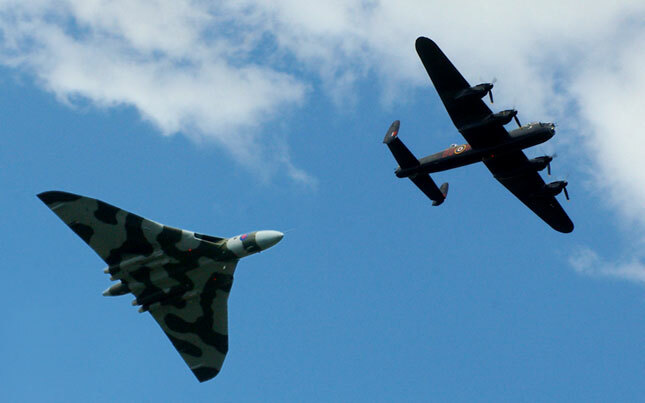 The timings are a little vague at present, but we’ve been advised that XH558 should shake the Silverstone grandstands at some time between four and four-thirty on Saturday afternoon, and similarly, mid-afternoon at Goodwood the following day. 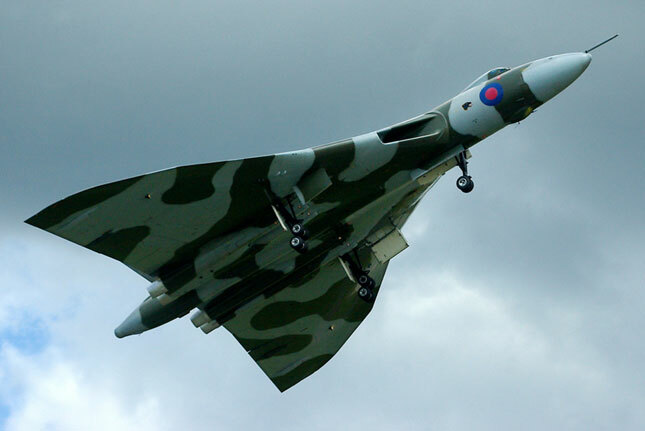 The link between a fast, noisy and enormously impressive aircraft, like the Vulcan, and the fast, noisy and exciting racecars of Silverstone and Goodwood, is more than just a “boys toys” thing. Actually, far from it, because it’s more tangible than that, and there really is a surprisingly close relationship between XH558 and motorsport, but more on that later. First, a bit of background . 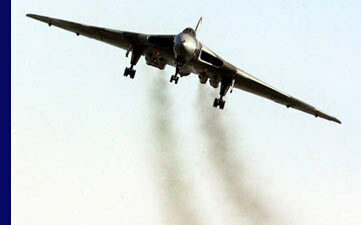 . .
What is it about an Avro Vulcan that can bring tears to the eyes of grown men – and women for that matter? It’s easy enough to understand when one sees, for example, a fly-past by the Battle of Britain Memorial Flight. The distinctive drone of the Rolls Royce Merlin engine, whether it’s powering a Spitfire or a Lancaster, is a unique and very emotive one, and the glimpse of those aircraft, still gracing the skies after sixty years never fails to send a shiver down one’s spine. It conjures up mental images of young men in leather jackets, the thud of ack-ack, boundless bravery, and crackly speeches over the Home Service wireless. It’s heady stuff - Britain’s “Finest Hour” and all that - so how can a plane that only retired from active service twenty years ago achieve much the same effect? Pride, certainly, but there’s also a fair amount of that “Shock and Awe” that we heard so much about from the US Air Force a few years ago. The Vulcan is, truly, an awesome bit of kit. 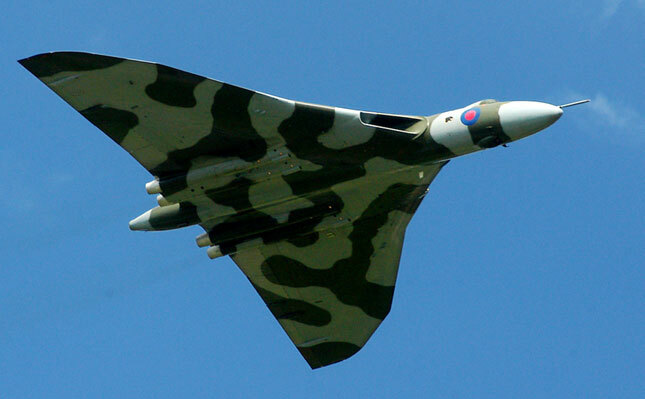 Arising from the dark and sinister era of the Cold War, the Vulcan was one of three so-called V-Bombers, designed and created in the years immediately after the Second World War to carry and deliver Britain’s nuclear bomb to the Soviet Union. 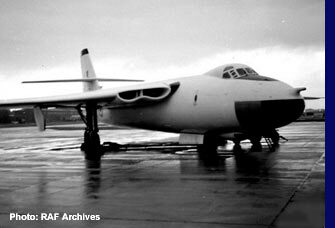 The first of these, the Vickers Valiant (left), made its debut in 1951, while the Avro Vulcan and Handley Page Victor (below) followed a year later. For twenty years this Strategic Nuclear Strike Force formed the backbone of Britain’s nuclear deterrent. At its peak in the mid-Sixties there were 50 Valiants, 39 Victors and 70 Vulcans patrolling the skies, and perhaps the fact that never once did they fulfil their role in anger suggests that they performed their duties perfectly. When the time came for the V-Bombers to be withdrawn from service, they did so in the same order they’d appeared. 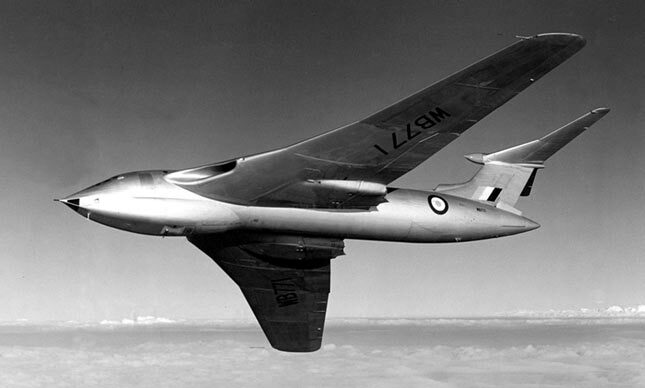 The Valiant, which was a more conventional aircraft in design and construction, was the first to end its active days. The plane suffered from premature metal fatigue at the base of its broad wings, and was withdrawn in 1965. The Victor – perhaps the most shapely of the three – was converted to an airborne refuelling role, and continued in service until the first Gulf War in 1991. The Vulcan (right) was also converted to tanker duties during the 1980’s, but retired from the RAF front-line in 1984. 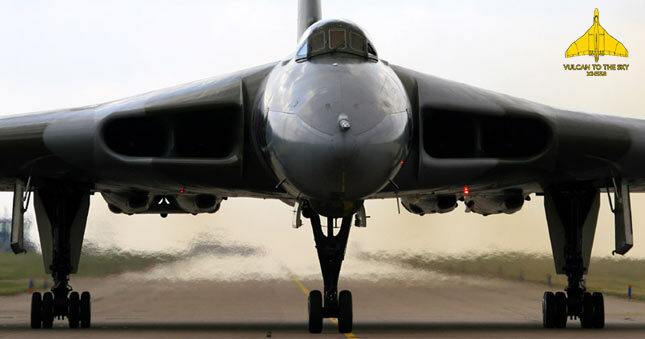 Prior to this, and having been stood down from their nuclear role following the introduction of the ICBM, the Vulcans were converted to carry conventional armaments, and could deliver a payload of twenty-one 1,000 lb bombs. Two years after this, having been converted to in-flight refuelling tankers, the final Vulcans were retired from active service. One, however, XH558, was retained by the RAF, and for the next eight years she wowed the crowds at air displays all around the country. Stripped out and lovingly maintained, she was lighter and fitter than ever before. I recall seeing her at the last-ever Upper Heyford air display in 1992, where slack-jawed F-111 pilots stood in amazement as this massive aircraft performed turns and rolls with the agility of a fighter. Aptly named, the sheer gut-wrenching howl of the Vulcan at take-off, when those four Olympus 202s were at maximum thrust, was like something erupting from the furnaces of Hell. Sadly, at the end of that year, the RAF declared that the cost of keeping her airborne was too great a burden, and she was packed off to Bruntingthorpe in Leicestershire and hobbled. Yes, she could taxi up and down the runway, but never again would she grace the skies. 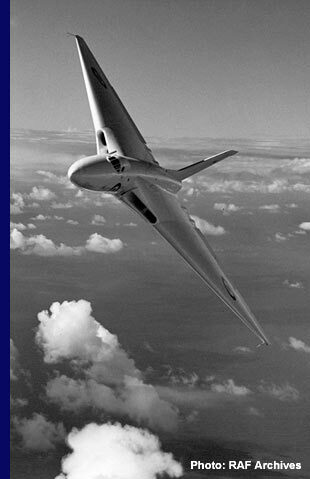 That was until the Vulcan to the Sky Trust was formed. 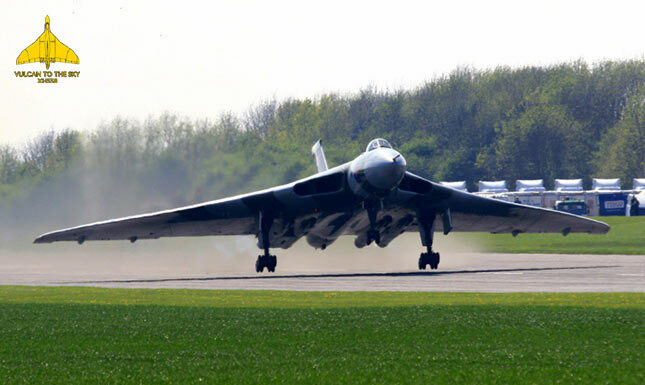 Over the last three years the Trust has battled to get the last surviving Vulcan back into the air, and they finally achieved their objective on 18th October 2007, when XH558 completed a 34-minute test flight. The restoration had cost more than £6 million, much of it by private donation, as well as countless hours of hard work by volunteers and enthusiasts. Just over £2½ million came from lottery funding, as well as individual donations varying between a few pence and £500,000. It was a monumental achievement, but the fight wasn’t over yet. Just getting XH558 air-worthy again was only one battle in a lengthy campaign. One of the largest and most complex aviation restoration projects ever attempted had ticked so many boxes, but it still needed to acquire that official signature at the bottom of the form that would not only permit the plane to fly, but to perform at public displays. That was when the motorsport connection kicked in . . .
Ann Newton, wife of RML racing driver Mike Newton, has always been a plane enthusiast, and had seen the Vulcan at various air shows during the early 1990s. Then, soon after XH558 made that inaugural flight in October last year, she became aware of the new challenge facing the Trust. Part of the requirements behind the Vulcan’s receipt of lottery funding was that she should become the centrepiece to an educational programme highlighting Britain’s role in the Cold War, and having the cameras aboard XH558 will give schoolchildren a much better idea of what it is like to “fly” in one of these awesome aircraft. “Taking the programme forwards into schools is the next stage,” says Ann. “There is also the question of finding a permanent base for her.” XH558 was at RAF Waddington in Lincolnshire for six weeks from June, and then moved to Brize Norton for servicing and repairs in August. She’s been there ever since. The Trust intends to keep XH558 flying for as long as possible, but the mechanical life of many of her components, including the airframe, means that she cannot be kept flying for ever. Her schedule is to complete about fifty flying hours per year at a cost of roughly £135,000 per month, and at a gross annual cost of just over £1½ million. 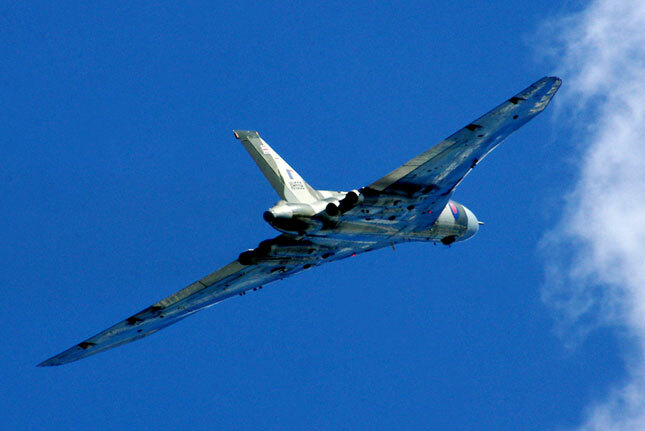 So, as you shield your skyward gaze with one hand this weekend, and marvel as the Vulcan passes overhead, dig deep into your pockets with the other, and promise yourself that, when you get home (or now, if you prefer), you’ll visit the website and offer whatever support you can. Click on the banner below to visit the website. 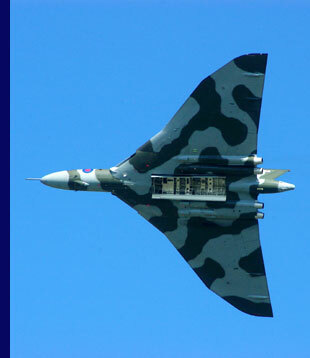 With thanks to the Vulcan to the Sky Trust for the two photos above, bearing their distinctive logo. The black and white photos are courtesy RAF Archives. All other photos were taken by Marcus / CMC Graphics at the Waddington Air Show in July 2008. Any reproduction elsewhere must include an acknowledgement.